Nazraeli Press is delighted to announce Mark Steinmetz’s follow-up monograph to his classic trilogy “South Central / South East / Greater Atlanta”. “Summertime” is a series of portraits of kids and teenagers caught in the midst of activity in distinctly American settings. Made between 1984 and 1991, when kids and teenagers were able to roam their neighborhoods with less supervision than today, riding bikes without wearing helmets, and hanging out without constant digital interruptions, these black and white photographs capture the light and feel of an endless summer. Beautifully printed on uncoated Japanese stock with our exlusive “Daido black” ink, “Summertime” is printed in a first edition of 1,000 casebound copies. Mark Steinmetz is a Guggenheim Fellow. His work is included in the collections of the Museum of Modern Art, the Metropolitan Museum of Art, the Whitney Museum of American Art, the Art Institute of Chicago, and the Los Angeles County Museum of Art. 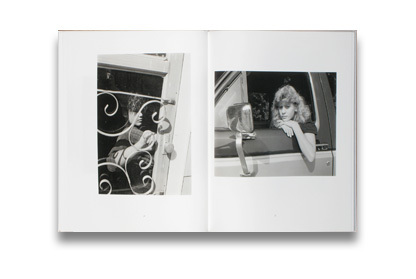 His previous book “Ancient Tigers of My Neighborhood” was published as part of our Six by Six series, and was singled out as a best book of the year at the 2011 Kassel Fotobuch Festival. This special edition of Summertime is limited to 25 copies with an original 11 x14 inch silver gelatin print, numbered and signed by the artist and presented in a clamshell box. TR375-LTD Limited Edition is no longer available.